In the My Schedule page, you can choose which meals Real Plans will plan for you, fully customize each day of your weekly schedule to meet your needs, and add notes to remind you of weekly events or to schedule leftovers. Let’s look at each one below. 1. Our Meal Planner will use the information you select to plan meals on the days you choose. If you eat lunch at the office on Wednesdays, you do not need Real Plans to plan your lunch on that day, so you can slide that toggle to the left to turn it red (off). If you want to plan for leftovers for your lunches, you can slide all the lunches to off since you don’t need us to plan those for you. The number of meals you decide to cook is completely up to you. 2. 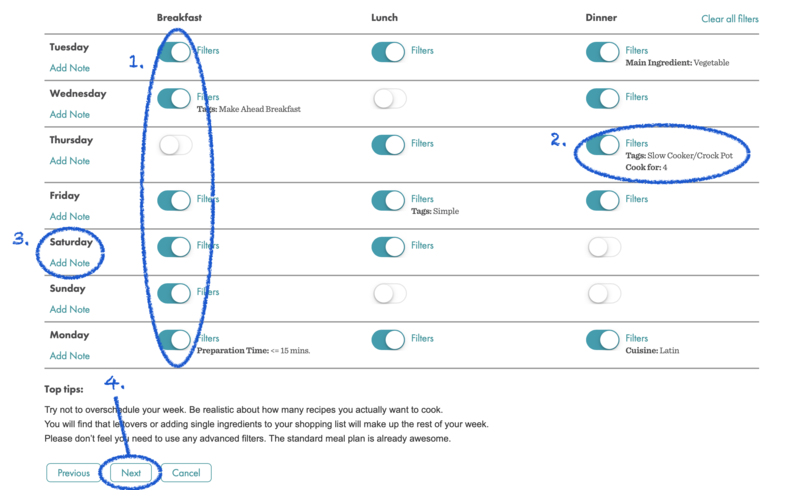 If you want to customize your schedule even more, you can go ahead and use our Advanced Filters to schedule meals that meet your specific needs. Our Advanced Filters support article will give you more detailed information on how to use our Advanced Filters to fully customize your week. This is where you can increase your dinner servings to plan for leftovers the next day or tell the meal planner to schedule a slow cooker meal every Monday. There are so many possibilities, and this will help make sure you are getting the types of meals that work for you. 4. Once you’ve made all your schedule changes, click Next to confirm how you want your choices applied. If you have already made changes to this week’s meal plan or have already done your shopping for the week, select “Update My Future Plan”. This will keep this week’s plan the way it is and update future weeks. 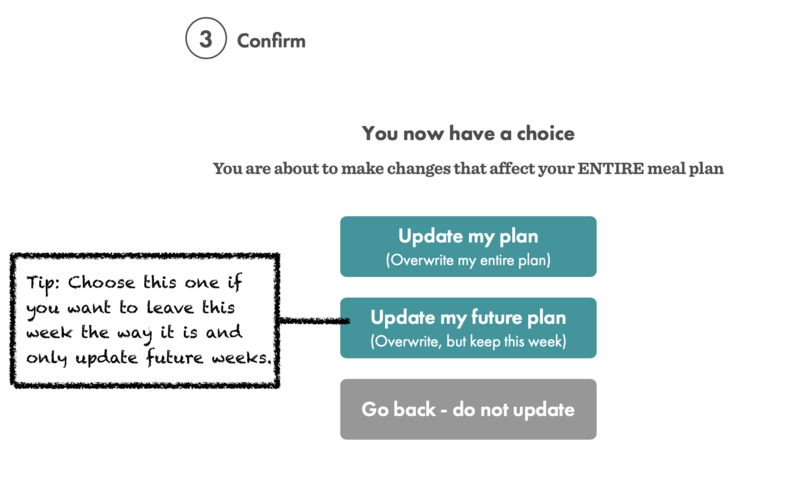 If you don’t want to keep this week’s plan, select “Update My Plan” to apply your changes immediately. This will overwrite your entire plan, including the current week. Your new fully customized meal plan is ready to go! Select “Go to Meal Planner” to feast your eyes upon your new plan.